Apartment situated in very popular and established hotel, close to Porto Colon marina and Torviscas beach with its popular beach bars. Complex has 24hr reception, security and has 4 pools (large, jacuzzi and 2 children's), lifeguards and daytime and evening entertainment programme with cabaret shows. Tennis court, pool and football tables in pool bar/restaurant area. TV and games lounge, hairdressers and car hire and excursion bookings. There are numerous outlets to change money. The views from the huge balcony are superb with both sea and mountain views. The hotel is ideal for families or as a base to venture to the evening bars and shows. There is a restaurant in the basement offering breakfast, lunch and evening meals. The poolside bar also provides snacks, there is more than adequate sunbeds, umbrellas and tables. This is an excellent place to relax and recharge your batteries or simply party your holiday away. This property has been owned by ourselves for the last 9 years, and as we have our own pub/restaurant and being in our early 50's this is an ideal place to escape to when there is a space for availability, with its all year round sunshine and warm temperatures we fell in love with the island, hotel and unique surroundings. We spruce up the decor on each occasion that we visit to keep the maintenance bills to a minimum, and to leave the apartment as presentable as possible and to the standard that we feel should be provided. We are certain that if you visit this property you too will feel as we do. We bought this property because it is within walking distance to the beach, has excellent security and assistance from staff, is very efficiently run and has all the amenities that you require to have a relaxing and enjoyable holiday. The pools are expertly maintained to the highest standard and the sunbathing area around the pool has extremely adequate sunbeds. There is also a rooftop bathing area as well above the pool bar and restaurant. Immediately outside the hotel are numerous bars and very good quality restaurants at very affordable prices. It is also within easy walking distance(approx 15 mins) of Siam Theme and Water park,n and also the long established Aqua Park. This property is convenient for all that you would wish for in a holiday, it is well established and much sought after. Holiday makers return year after year because of the excellent service, location, and the surrounding bars, restaurants and the beautiful views. You are also certain of peace of mind in that the security is of the top quality that you would expect within a hotel of this calibre. 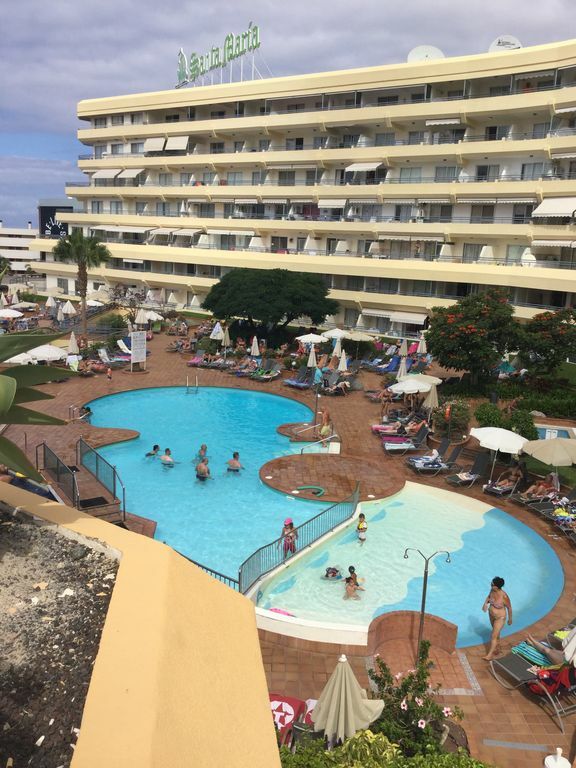 There is also the very big bonus with this property of a huge balcony with sunbeds, patio table and chairs for you to enjoy whilst getting a tan and admiring the views. There is ample room in the fridge for beers and wine and 2 freezers to store the much needed ice. Fully tiled bathroom with walk in shower, bath, wash basin with mirror and overlights, WC. Large lounge with 2 double patio doors to huge balcony and small window, double sofa bed, TV with satellite programmes, ITV, BBC, Ch5, sport and news channels, DVD player, dining table and chairs, portable air-conditioning. Refurbished modern kitchen with oven, 2 hobs,extractor washing machine, fridge/freezer and freezer, kettle, microwave, toaster, breakfast bar, ample cupboard space, iron & ironing board. There are numerous golf courses within easy reach. Notes on accommodation: The complex has 24hr security and very well run. There is limited car parking spaces available. There is a comprehensive entertainment programme for both children and adults. There is also a roof top solarium. Outside: There is a very large solarium area with sunbeds and umbrellas. There is a barbecue once a week, and paella cooked before you once a week also at the pool bar/restaurant and small garden area. It has a rooftop solarium with flower beds. There is a large pool, with lifeguards, a jacuzzi pool and 2 children's pools. There is a supermarket opposite hotel for all your needs and numerous shops including jewellers, shoe shops, tobacco and liquor shops and souvenir shops. There is a taxi rank at the bottom of the ramp to the hotel. There are also a large amount of take away restaurants in the immediate vicinity. There are a number of buses that pass the hotel to take you to other tourist areas on the island, with the bust stop 200 yards from hotel. Cleaning / Towels / Linen / Maid service: Towels and linen are included and changed weekly, property is thoroughly cleaned prior to your arrival. Just returned from another great stay. Apartment is in a great location for restaurants, bars and the beach. It has two bedrooms one with single and one with a double bed. It has a very large balcony Which has lovely views out to the sea, it can sometimes be windy on the balcony but you can usually find a spot out of the wind. It is a lovely spot to relax with a good book or a cheeky drink or two. The Pool area has had all its sun beds replaced recently. It has everything we needed for a sun break and I will definitely be using Steve’s apartment again. Was a great appartments and very clean and tidy. Very spacious with patio doors out onto balcony from each room.Big balcony and outstanding views off harbour.sea and mountains.Everthing u needed was in appartments.All English channels.Would go back to same appartments. Costa Adeje is a great place to holiday with some fantastic restaurants and beaches. Not the reasonable priced area it once was, it is now become more expensive than at home and I would say a lot of the people are not as welcoming as thay once were. I don't know if this is anything to do with Brexit but I did notice the same attitude in Majorca too. I won't return to Spain for a few years as I'm quite sure we are not alone in feeling this way. Just be staying in British Isles for the near future. Had a lovely holiday owner was very helpful. Apartment was first class excellent balcony. Close to beach restaurants and bars. Would definitely book again highly recommended. 5 mins walk to picturesque Porto Colon marina and beach and Fanabe beach each just a short distance on. There is a coastal walk to Las Americas and Los Cristianos with bars and restaurants on route. There is a wide range of water sports and activities available at both beaches. The beaches have an array of seafront bars, shops and restaurants. Tenerife sur Airport is a 20 minute ride away in a taxi. Booking Notes: It is recommended that you book as far in advance as possible as this apartment is much sought after. A non refundable deposit is required at time of booking, and a small damage security deposit required with balance. This security deposit is refundable. All prices are in GBP pounds sterling. Changeover Day: Days of arrival and departure are flexible.